gam·brel (gam-brəl) n. A two-sided roof with multiple slopes on each side,the lower slope having the steeper pitch. The unique roof angles add extra height. The gambrel shed, also known as a barn shed, features steeper lower roof slopes which provide more headroom, making Gambrel sheds the perfect choice of roof styles for those who need overhead storage. 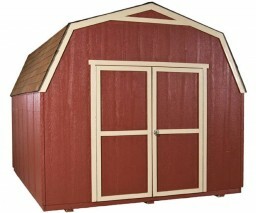 This style is also a great choice for those wanting more storage space without having to purchase a larger sized shed. Gambrel style roofs serve numerous decorative and functional purposes. 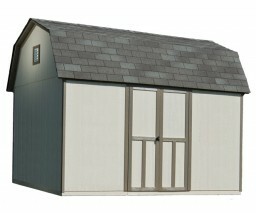 Check out our Gable sheds or Ranch sheds to see which style might be best for you. Do you remember the days when you first moved into your home and it you had plenty of storage space? Most people don’t… However, we have several strong and practical storage buildings available that can keep your tools, equipment, ATV’s and collectibles organized at a low cost. Thanks to the beautiful roof style of barn sheds, your storage solution will even add more charm to your backyard landscape. With 35 years of experience, we have perfected our manufacturing and installation process to maximize efficiency and build quality. Best of all, our experienced team of builders can install your shed right in your backyard. Now that is convenient! Our barn sheds feature a strong wood frame construction that can easily handle heavy wind and snow loads. The specially engineered LP® wood siding acts as a protective barrier against rot, decay and insects. Furthermore, 20-year shingles help protect your building from the elements. All of the features are complimented by a 2 year warranty. 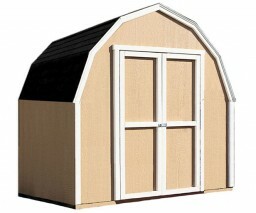 Along with the extra headroom provided by the gambrel design, our sheds can be tailored to meet your unique needs. To keep items off the floor, add a shelf or workbench. For extra functionality, add metal ramps, felt/ drip edge and a venting skylight. Lastly, add more decorative charm with a flowerbox and window. Consider this website a starting point to making your outdoor storage ideas a reality. 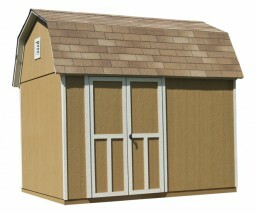 Click on the links below to view more sheds!